JFK Airport Parking : JFK is one of the busiest airports in the United States. JFK is closer to Queens and Brooklyn than Manhattan, making it ideal for travelers going to the boroughs. There are fantastic restaurants inside the airport. TravelCar offers unique solutions to the challenges of parking at JFK. TravelCar allows for nearby parking at phenomenal rates. You’re not limited to just JFK with TravelCar. TravelCar reduces stress and helps you by offering car cleaning services. You will get excellent service with TravelCar. JFK is organized around a main access road, and there are multiple nearby lots, the closest being OROM through TravelCar. Parking can be expensive, TravelCar solves this problem. TravelCar is professional and industry-leading, offering excellent valet service. No one beats TravelCar’s service. Travelling to JFK can be challenging, but planning helps. You can travel to JFK by AirTrain, driving, the Airporter, third-party shuttles, or taxi. Traveling by car is flexible and cheaper than taxis. Luggage and walking from on-site parking lots take time, but TravelCar will save you time and reduce the stress inherent to travel. John F. Kennedy Airport of the borough of Southern Queens, New York, New York is one of the world’s most famous airports. With cameos in thousands of movies, television shows, and travel specials, most every traveler has heard of JFK at some point. JFK was constructed in 1943 and was home to its first flight in 1948. As of last year, JFK serves just shy of 60 million passengers per year across 446,459 flights. Six terminals with 128 gates serve over 25 miles of taxiways with four runways, the longest of which is the third longest runway in North America. Measuring in at 14,511 feet, the 13R/31L runway of JFK Airport falls just one foot short of the Las Vegas International runway, the second longest in North America, and approximately 1500 feet shorter than Denver International Airport’s runway, which holds the title of longest runway of North America. Being about 12.5 miles from Manhattan but a single tram ride away from many of the neighborhoods of Queens, JFK is the place to go for those looking to enjoy the New York that exists beyond the island of Manhattan. While both Newark and LaGuardia are ideal for visitors hoping for fast transit to Manhattan, JFK serves global travelers better than either option, with the most international flights of any New York City airport. For travelers flying out of JFK, nearby parking options couldn’t be easier. TravelCar, for example, offers unmatched remote shuttle and valet parking with lots nearby, so you can fly with peace of mind. Travelers flying to NYC through JFK should know that JFK airport is home to some absolutely incredible food options, meaning you don’t have to slog through traffic before getting a bite of New York’s world-famous cuisine. The Uptown Brasserie by star chef Marcus Samuelsson showcases a culinary road trip of the United States. Piquillo is just as notable, being the most recognizable Spanish tapas restaurant in any United States airport. Start your trip off right, and don’t commute on an empty stomach. If you will be in New York for a few days, take your time to enjoy everything JFK has to offer before you head out to the hustle and bustle of the Big Apple. Finding cheap parking at any airport can be extremely difficult, and JFK is no exception. In fact, with thousands upon thousands of commuters traveling to, from, and around the airport, parking at JFK can become a significant hindrance to travel if you aren’t prepared. Thankfully, TravelCar has managed to build a working system of quick, low cost parking around JFK. By partnering and coordinating with local, respected parking companies, TravelCar is able to offer parking spaces closer and with better prices than any competitor. With TravelCar, parking less than 5 minutes away is just $12.95 per day with free shuttle service and optional, affordable valet service. Shuttles are accessible, frequent in schedule, and easy to identify, ensuring that you can get cheap parking that also won’t make you late for your flight. If you’ve got business to attend to or events lined up following your return flight, TravelCar’s valet service can have your car at the curb, and they can even have it cleaned and polished before it meets your eyes. TravelCar’s carwash and valet service are unmatched. You’re not limited to JFK, though. TravelCar offers cheap parking, valet service, and even carwash service at most airports in the United States, major train stations like Penn Station, cruise ports like Port Miami, and popular neighborhoods around the country. If you’ve ever tried to find parking before catching a subway from Penn Station, you probably understand just how frustrating last-minute parking prices can be. Not only that, but there’s no stress quite like scrambling to find parking before you catch your 7-day cruise out of Port Authority of New York. You’ll have no such stress parking with TravelCar. They’ve got both locations covered. If you’re taking clients out for dinner after a long flight, have TravelCar valet and wash your car. There’s nothing quite like getting off your flight and climbing right into a fresh, sparkling car. Best of all, you can rest easy knowing you got a bargain of low cost parking and excellent service. TravelCar offers top quality service, cheap parking, quick shuttles, and valet options all over the country. If you’re traveling, chances are that TravelCar has lot partnerships near you. Travel easy in your own car, saving money and time that would otherwise be wasted with taxis or short-term rentals if you weren’t able to park your car. Traveling is stressful enough without worrying about before-and-after transit. TravelCar offers secure, gated lots equipped with video surveillance and security guard patrols. In addition, most major lots are covered, indoor garages with plenty of space for vehicles of all types. TravelCar focuses on streamlining the otherwise bumpy process of finding parking that is attended by quality customer service agents, secured effectively, and, sometimes most importantly, not prohibitively expensive. Where Is Parking at JFK? The first thing any traveler driving to JFK should understand is that JFK is serviced by a major access road that connects with the Van Wyck Expressway. Large parking garages have been constructed around the inner loop, loosely corresponding to each of the main JFK airport terminals. However, there are a number of independent parking garages located just off the access road, less than 2km from each JFK airport terminal, which offer considerably cheaper parking than on-site parking with less traffic. 1 OROM Airport Parking North, 2km 07:00 – 23:00 Eastern Shuttle runs from 7:00 until 22:30 every 10 minutes. 2 OROM Airport Parking North, 2km 07:00 – 23:00 Eastern Shuttle runs from 7:00 until 22:30 every 10 minutes. 3 OROM Airport Parking North, 2km 07:00 – 23:00 Eastern Shuttle runs from 7:00 until 22:30 every 10 minutes. 4 OROM Airport Parking North, 2km 07:00 – 23:00 Eastern Shuttle runs from 7:00 until 22:30 every 10 minutes. 5 OROM Airport Parking North, 2km 07:00 – 23:00 Eastern Shuttle runs from 7:00 until 22:30 every 10 minutes. 7 OROM Airport Parking North, 2km 07:00 – 23:00 Eastern Shuttle runs from 7:00 until 22:30 every 10 minutes. 8 OROM Airport Parking North, 2km 07:00 – 23:00 Eastern Shuttle runs from 7:00 until 22:30 every 10 minutes. 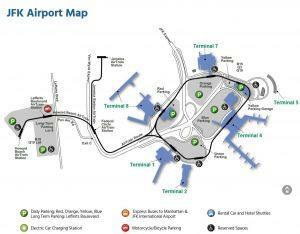 *Note: JFK Airport terminal six is no longer in use, though it sometimes appears on older maps of the airport. Why Choose TravelCar Over Other Parking? Anyone who has traveled frequently knows how difficult—and expensive—parking can be. Many proprietary parking spots take advantage of the fact that they’re physically nearby to charge incredibly high rates, even though it might actually take you just as long to reach your spot as if you had gone with an off-site parking lot with a shuttle. TravelCar gives you the ability to plan in advance, skipping long waits for airport shuttles and the long walks to your car. Booking takes seconds, and lets you immediately see the closest lots to airports and other major destinations. TravelCar is known for their professionalism, clear communication, and quality lots. They have regularly maintained a score greater than 9 on TrustPilot, with hundreds of reviews from customers whose trips have been improved by parking with TravelCar. These facts make the TravelCar valet service offer even easier to choose; walk right off your flight into the comfort of your own car. No hassle, no stress. TravelCar’s service is second-to-none. They’ve regularly beaten out competitors and proprietary services in every metric. Call their valet service to have a professional TravelCar agent deliver your car to the curb, ready and running. Just like any location in NYC, getting to JFK can be a challenge in its own right. Most travelers will take the expressway which connects to the airport via the JFK access road. However, nearly as many travelers will arrive via the JFK AirTrain (also known as the “JFK Tram.”) The tram connects with most of the NYC metro transit options, like the NYC subway system and the NYC bus routes. The AirTrain runs 24 hours a day, travelling between major stations with arrival times ranging from 8 – 12 minutes in the evening and between 5 – 10 minutes during the day. Travel times transferring from the subway to the AirTrain run between 50 minutes to an hour and 5 minutes from the major stations of NYC. Unless you are coming from Long Island, you can expect to pay about $7.75 in metro fees. Driving times understandably vary depending on the time of day. From Midtown, you can expect between 55 minutes to an hour during peak travel hours. From Brooklyn, peak travel times tend to range between 50 to 55 minutes. In the early evening, when delays are more frequent, you can expect about an hour and 20 minutes of driving to get from midtown to JFK. Getting to Jamaica and Queens are both considerably faster, with travel times averaging about 15 to 20 minutes, even with heavier traffic. The New York City Airporter bus service runs every 20 to 30 minutes from Grand Central Station to JFK. During peak hours, the trip takes approximately an hour and a half, costing between $16 and $30 depending on your individual needs. While JFK runs shuttles to their on-site parking, most shuttles travelling to locations outside the airport are not run by the airport and would need to be booked through a private service. Finally, taking a taxi is always an option. Taxi wait times during off-peak hours are often negligible, but, during peak hours, they can add to your travel time. Taxi wait times are featured on JFK’s homepage online, so you can check in advance if you’re thinking of taking a taxi. Taxis tend to cost more than $50, especially when considering the cost of tolls, which are often passed on to the customer. Traveling by car is by far the most flexible option for travelers to JFK; however, because of the fluctuations that occur in traffic patterns, you should be careful to have parking, travel times, and driving routes organized and researched in advance. Taxis can be very convenient, but no one likes a surprise bill. So, unless you’re already planning for taxi costs, try to be sure that you have off-airport travel organized before you land. With any major airport, luggage check-in and pick-up can take time. Always make sure you allot extra time for dealing with luggage, ticketing, and security. Luggage and check-in can take even more time if you’re walking from an on-site parking lot, which can mean waiting for elevators, trying to find luggage carts, and consulting airport walking maps. This airport challenge makes valet services like TravelCar particularly convenient, saving you time and reducing your stress by giving you more buffer time to work with.